The stock tech column was getting a little thin lately, so I decided to rework my seats and post it for what its worth. That's what I started with. 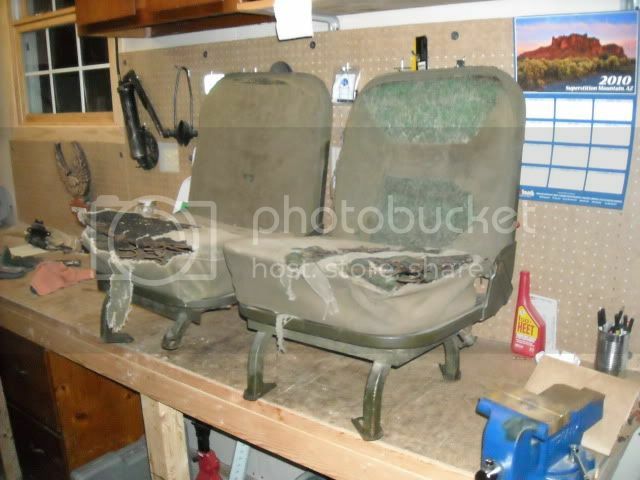 Mouse nest in both seats, but old ones, not from my garage. This is the pattern for the string, not sure if it is right. Other seat used speaker wire to hold the cover on. 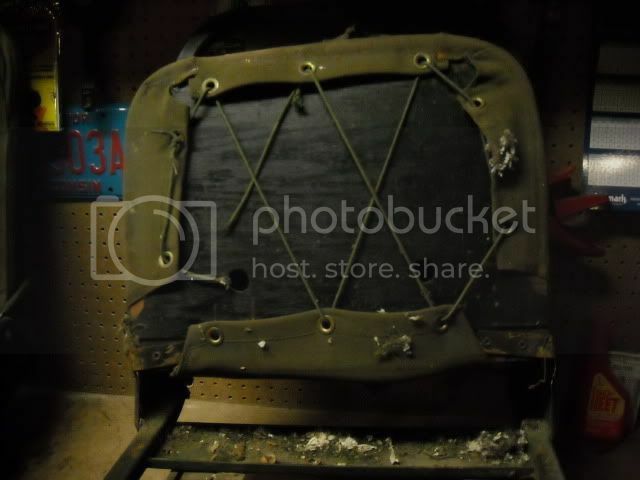 The one seat back with the fire extinguisher has the four bolts to hold the bracket on poking out and into the canvas cover. I'm going to reverse the bolts and have the heads to the canvas cover to minimize any chafing. Removed all the horse-hair matting and spent some time straightening the spring packs and trimming all loose wire ends to minimize poke-thru. Replaced all the hinge bolts and washers with new ones. Used lock-nuts. Taking the seats to work tomorrow and powerblast them clean. As it turns out I'm starting the same project. The only differance, I'll be using foam for padding. I will follow along as a student (so you can show me how to string the bottom). When I opened the package and the string fell out I said to my wife "This is why I have velcro shoes". I ordered new covers from Surplus City Jeep Parts, to match the cab top I got from them last year. Should have them in a few days, they have the seat covers in stock. You can see where the four bolts from the fire extinguisher penetrate into the lower seat back cushion (if it was there). I'm going to remove the brackets from both seats. 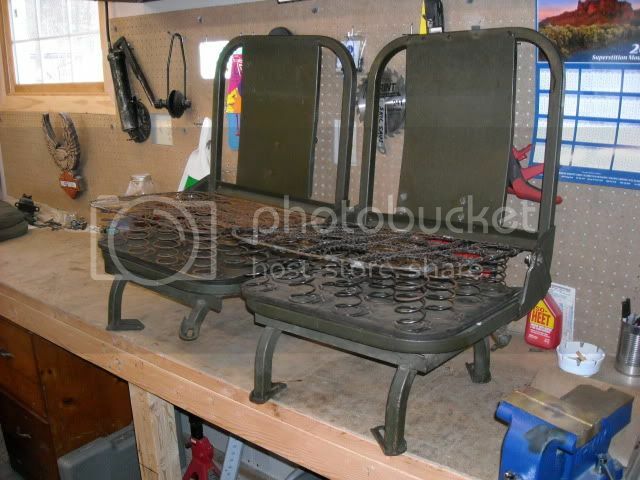 I need seats but have the frames. I'll take them. Let me know what shipping is to 32696 and I'll pay you for shipping. I guess I'll have to track down some seat backs too. I want to use the OD leatherette from beachwood for my seats, its vinyl in od (which is required for the litters in ambulances) no smell, no staining clothes. And yes- dense foam for the padding makes a big difference, you just need to attach it to the springs some or it will shift over time under the cover. My passenger seat (out of a duece) I redid with 4" upholstry foam in place of the springs and horsehair pads. I like that seat sooooo much better than the springy stock driver's seat. But I can't drive from the right seat so I'm stuck bouncing along. Nice thread, fishtail. Did you re-tack the back panel to the top of the seat frame? Looks like someone did. I had to on mine. I also added a strip of 1" wide 1/8 thick strap for reinforcement. It just looks like that in the photo, but its factory. One question I was going to need to ask once I got around to the seats is.."are the metal panels on the back supposed to have a curve to them or are mine bent?" The spot welds on both of my seats are broke.